iFly. What better way to spend time with your family than creating memories? Get into the spirit of togetherness and do something different at iFLY, great for all ages- flyers start at 3 and up! 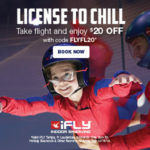 Use promo code FLYFL20 for 20% until 12/15! Gryph and Ivyrose. Gryph and Ivyrose offers the perfect gifts for the smallest to the biggest kids in your family! An immune-supporting bath & body line made with safe, gentle, & effective botanicals like hibiscus and goji berry; herbal elixirs that support your children’s sleep, mood, & immunity; and probiotics made with yummy cacao, heirloom banana & vanilla. Use code MUNCHKIN for 15% through Dec 15. Art & Culture Center Hollywood. 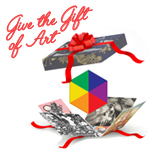 Give the Gift of membership! Family Membership to the Art and Culture Center/Hollywood gives your family free admission to the Center galleries plus discounts on Summer Arts Camp and school-year classes. Learn about our Friend-level membership providing reciprocal admission to 1,000+ member institutions through the North American Reciprocal Program. Click for details. 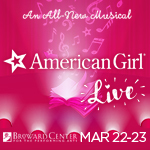 American Girl Live @ Broward Center. Experience American Girl in an all-new musical! Inspired by American Girl’s most iconic characters and their stories, American Girl Live is a premiere stage production, featuring all-original songs and unforgettable experiences. Come along for a fun-filled adventure, where exciting tales of bravery and friendship come to life, LIVE and in-person! ©2018 American Girl. All American Girl marks are trademarks of American Girl. Copyright Mills Entertainment 2018. All rights reserved. Mar 22-23 at Broward Center, click here for tickets. Charlie Brown @ Aventura Arts & Cultural Center. The whole Peanuts Gang is here in this crowd pleasing classic! Lucy is in love with Schroeder who doesn’t give her the time of day, Sally is still mocking Linus, Snoopy is in the doghouse, and Charlie Brown, is in rare form. Regular & Sensory-Friendly Performances. March 14-17 at Aventura Arts & Cultural Center, click here for tickets. 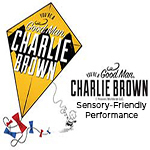 Sensory-Friendly Performance: Charlie Brown @ Broward Center. The whole Peanuts Gang is here in this crowd pleasing classic! This modified performance is produced with slight adjustments to create a sensory-friendly setting that welcomes and supports children and adults on the autism spectrum as well as individuals with other sensitivity issues or developmental disabilities. March 2 at Broward Center for the Performing Arts, click here for tickets. Daniel Tiger Live @ Broward Center. 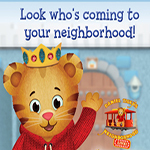 Based on the #1 PBS KIDS TV series, Daniel Tiger’s Neighborhood Live: King for a Day! invites you aboard Trolley for an adventure to the Neighborhood of Make-Believe where Daniel learns just what it takes to be King. You’re sure to have a royally great time. April 11 at Broward Center for the Performing Arts, click here for tickets. 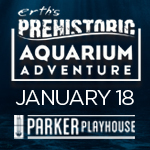 Erth’s Prehistoric Aquarium Adventure @ Parker Playhouse. Erth’s Prehistoric Aquarium Adventure is an immersive experience that invites you to jump in and explore unknown ocean depths where prehistoric marine reptiles lived eons ago – and maybe live still today! Erth shows are at the forefront of family entertainment, using actors, technology, puppets, science and imagination to create an amazing visual experience that connects young audiences to the real science of paleontology. Jan 18 at Parker Playhouse, click here for tickets. 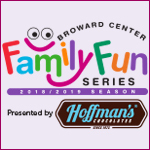 Family Fun Series @ Broward Center. Your children’s favorite characters are live on-stage at the Broward Center for the Performing Arts Family Fun Series! This season, experience Rosie Revere Engineer, Madeline, & Pete the Cat plus tickets include pre-show crafts & face painting plus other surprises! Presented by Hoffman’s Chocolates. Click here for tickets & info. 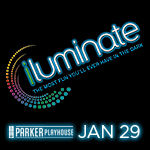 iLuminate @ Parker Playhouse. iLuminate gained national attention on TV shows including America’s Got Talent, Dancing with the Stars, X Factor and The Ellen DeGeneres Show. Using state-of-the-art technology and electrifying entertainers they create the ultimate performing arts experience. With a mash-up of dazzling wizardry, spectacular dance moves, high-tech effects, and music, iLuminate delivers a unique-in-the-dark event. Jan 29 at Parker Playhouse, click here for tickets. 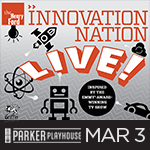 Henry Ford’s Innovation Nation Live @ Parker Playhouse. Innovation Nation – Live! is a family show for children 10+. Like the popular show on CBS, this show will engage with the audience about past innovators and how they are influencing science, technology, agriculture, design, and social justice of today. Henry Ford, The Wright Brothers, Rosa Parks and George Washington Carver among others will jump to life on stage. Their achievements are highlighted by showing examples of present day innovations. Mar 3 at Parker Playhouse, click here for tickets. Deering Estate. Celebrate Deering all year! Gift a membership to family and friends this Holiday Season. Members enjoy free general admission to Deering Estate and much more including admission to the famous Deering Seafood Festival this March, a Bizbash top 10 event. 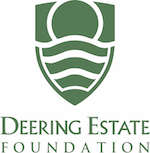 Visit Deeringestate.org/Membership today. Fairchild Tropical Botanic Garden. Give your munchkin joy wrapped in a Garden! Fairchild is ready to delight with 83 acres of tropical fun, including thousands of butterflies in the Wings of the Tropics exhibit, the NightGarden Magical Light Spectacular, festivals and more. Click here to buy tickets or here for membership. Call 305-667-1651 for info. Flamingo Gardens. Wrap up your holiday shopping at Flamingo Gardens! For the entire family: Membership means a year of free admissions, tram rides, special events + more! For the animal lovers and tree huggers in your life: Adopt a flamingo or other favorite animal, or dedicate a tree in their name. Miami City Ballet. 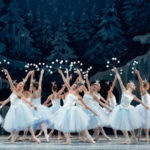 Miami City Ballet presents George Balanchine’s The Nutcracker. Treat your Munchkin to this holiday spectacular, which will transport them to an enchanted winter wonderland alongside toy soldiers, mischievous mice and the Sugarplum Fairy — all danced to the music of Tchaikovsky, performed by a live orchestra! Dec. 7-30 in Fort Lauderdale, Miami and West Palm Beach. Palm Beach Opera. 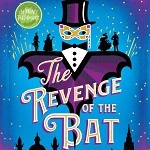 Palm Beach Opera presents Children’s Performance, a 60-minute abridged version of Johann Strauss II’s The Revenge of the Bat. Sung in English with supertitles above the stage, this iconic opera features beautiful costumes, lively narration, and a full orchestra. Experience Education Stations, a behind-the-curtain look at opera, and cast meet-and-greets! Click here for details. PGA National Resort & Spa. Purchases of $350 or more in Spa and Salon at PGA National gift cards earn bonus resort stay vouchers for you or to pass onto your loved ones. All 50-minute spa services include access to the exclusive Waters of the World healing pools. Call 561-627-3111 or save time buy gift cards online at SpaAtPGA.com. Phillip & Patricia Frost Museum of Science. Make Frost Science part of your holidays! 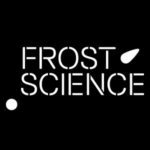 Share your love of science with a gift membership to Frost Science, a gift that will continue giving well beyond the holidays. Your loved ones can enjoy a year-long exploration of science. Click here for details. Pinecrest Gardens. 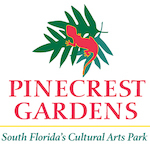 Give the gift of a Family Membership to Pinecrest Gardens this season. The whole family can enjoy the botanical beauty the venue has to offer everyday as well as free entry to all of the festivals including Nights of Lights, a holiday winter land of twinkling lights and activities. Click here for details. Pump & Dump: Parentally Incorrect Tour @ Broward Center. The Original Moms’ Night Out is back and better than ever! Join comedians Shayna Ferm and Tracey Tee for a hilarious and unique escape for moms everywhere (as seen on Today, People and Parents Magazine). Treat yourself and your #BREEDER friends to a cathartic evening of all-original music, comedy and games, guaranteed to make you laugh your c-section scar open. It’s rough out there in the Momosphere – you’ve earned a night out! Jan 18 at Broward Center, click here for tickets. The Real Food Academy. Give your munchkin a gift that will last a lifetime – the ability to cook. 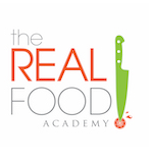 The Real Food Academy in Miami is standing by to delight your family with creative recipes & palate-expanding flavors. They’ll cook, they’ll chop, they’ll bake – and they’ll learn to love the kitchen. Check out Iron Chef, Rainbow Foods & other themed classes. Click here to buy a gift certificate or click here to buy a membership. Call 786-395-0355 for info. 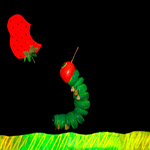 Very Hungry Caterpillar @ Aventura Arts & Cultural Center. Eric Carle’s strikingly bold images spring to life in the stage productions of his cherished storybooks The Very Hungry Caterpillar, Little Cloud, & The Mixed-Up Chameleon. Tickets include pre-show activities and other surprises! Presented by Hoffman’s Chocolates. Feb 24 at Aventura Arts & Cultural Center, click here for tickets. Your Alien @ Aventura Arts & Cultural Center. 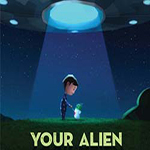 Based on the book by Tammi Sauer, a stranded alien strikes up a friendship with the boy who finds him in Your Alien. This funny and uplifting musical shows the power of true friendship. Tickets include pre-show activities and other surprises! Presented by Hoffman’s Chocolates. January 27 at Aventura Arts & Cultural Center, click here for info & tickets. When schools are closed, Gecko ParX is open! On Spring holiday Gecko ParX is hosting a fun-filled, safe day camp, providing unlimited excitement for kids 5-14. $50 per child. Call 954-526-8180 or click here for info. Take photos with your own camera, or photos are available for purchase in the gift shop. Make sure to enter our “eggstra” special raffle for annual memberships and animal experiences, plus enjoy a craft and one complimentary ride on the Wildlife Carousel. Included with regular Zoo admission. Explore nature topics in depth with informative lectures and field exploration.$8 per child, click here for more info. Explore nature topics in depth with informative lectures and field exploration. $8 per child, click here for more info. In this exciting musical journey, you and your little one will have endless opportunity to learn, laugh, move, and explore-KINDERMUSIK WITH MS DEBORAH! Admission includes a 45 minute salt therapy session, a 45 minute Kindermusik class with Ms Deborah, and an instrument for your child. Two sessions available: 10am-10:45am for children ages 18mos-4yrs, and 11am-12:00pm for children ages 0-12mos. $20, click here for more info. Embrace the earth with wonder an imagination as you create earth-friendly art with recycled materials.For ages 5 and under.Free with admission, click here for more info. Embrace the earth with wonder an imagination as you create earth-friendly art with recycled materials.